More pictures – Centre Tèt Ansanm is taking shape! The next-to-last post was sort of a cliff-hanger: when will FSRL get back to normal? The answer is that we are back in business, even though with some changes. 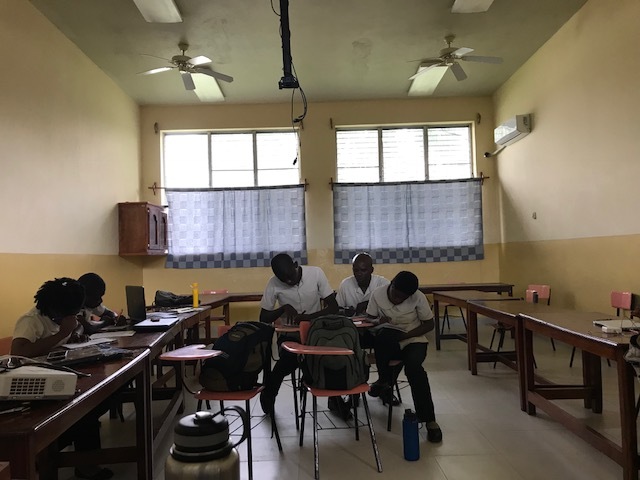 I got back to my desk in Leogane on March 17 or 18, and we did have visiting faculty (including two Haitian faculty) to keep classes going until the end of March. In the first week of April the students in 2nd, 3rd, and 4th year left campus to go on clinicals. The clinicals were supposed to be in summertime, but we have exchanged the seasons: classes will be in the summer instead. I want to thank the wonderful supervisors who agreed to take our students back, some of them within a couple weeks of the end of the last clinical placement! I also want to thank the fourth-year students for their work this month getting our NEW CLINIC at Hôpital Ste Croix open for the first time! They have cleaned it, bought paint and rollers, commissioned a welder to make parallel bars, scouted out mats and loaned their own mat tables, all necessary to have the basics ready to receive patients, probably in April! and on the sign it will give credit to FSRL and UNEPH. This is a wonderful, excellent ,exciting new development, thoroughly welcomed by the medical director and the nursing director of the hospital: Dr Alexy and Mme Germain. Setting up Clinic Tèt Ansanm! New parallel bars that the students commissioned from the welder on the corner of Rte de Belval, made after studying the photo in the catalog! Special congratulations to Emerson Barthelemy, Nicholson François, Amendocia Dorcé, Ramona Adrien, and Roosvelt Pierre Louis, fourth-years who have been scrubbing and walking and carrying heavy things this past week! Emerson opening a barrel sent to us last year by OTs Caroline Larson and Judy Criscitiello, of St. Pault’s Church, Bedford, Mass! Celebrate, Celebrate, Dance to the Music! Onstage, in the dim light of midnight, formal dress! At least three times during the academic year, the students of FSIL and FSRL organize and execute a formal party on the scale of a prom or a wedding reception, in the U.S.
Each cohort (sophomores, juniors, seniors) takes a turn. Classes are shut down the day before. The class forms itself into work crews: cleaning, setting up tables and chairs with white tablecloths and chair covers, stringing fairy lights and ribbons and balloons, hammering together the stage for performers, beginning to cook for 200 people. I’m sure that each person does also some preparation of ironing their formals and tuxes, as well as polishing the black shoes, trimming hair or setting it, and finishing manicures. On the evening of the fête, at about 9 pm, the place looks like a fine restaurant or club: the school has been transformed. The elegant students begin to emerge from the dorms, not looking at all like their everyday selves. Everyone comes, everyone stays, there are bubbly drinks, there is great entertainment. A lot of the FSIL and FSRL students are at a professional level as singers, dancers, and actors. There are funny skits, choreographed dances, social ballroom dance exhibitions, solos and duets, hosted by a tuxedo clad MC (also a student). And at midnight there is a feast! A buffet table with special dishes, ballooning in volume, ample for all the students plus any guests. I am told that after that the general dancing begins and goes until 4 am. I wouldn’t know, myself, as I go to bed after the midnight feast, and sleep like a log. THEN, amazingly, at 4 am most students go to the dorm to sleep, but the class designated to present the fête goes to work again to dismantle it. I got up at 6 am one time and went over to the courtyard, where I found students in elegant clothes, now mostly unbuttoned, and in bare feet instead of heels, pushing brooms and mops, moving slowly but still moving. By 10 the next morning, you would not know there had been a fête. There is a similar aspect to life in the Episcopal parish just across town, Église Ste Croix. The Episcopal church throughout the world observes a cycle of Feasts and Fasts. In most Episcopal parishes in the US, a “Feast” might mean that rarely used vestments are brought out for the clergy, and the choir prepares special music. But at Église Ste Croix, some of the Feast days are Over the TOP. For instance, the patronal feast of Église Ste Croix is Holy Cross Day, Sept. 15. The church is decorated in thick generous garlands of flowers, there are visiting choirs (at least three, sometimes more), clergy come from other parishes, and there is a procession of children, followed by adolescents, followed by middle aged adult women, followed by elderly women, each carrying a basket of fruits on her head to present at the altar. There is incense, lots of it! And afterwards there is a feast of food, prepared by the ladies of the parish, that is ample enough for all members AND all guests to eat their fill. People dress UP. Men of all ages (including toddlers) in two- or three-piece suits, women in elegant dresses, little girls in white frilly dresses with red sashes. A lively rocking hymn, little girls dancing in procession, for the patronal feast of Ste Croix church, on the Sunday closest to Sept. 15 (Holy Cross day) every year. One explanation can be found in the cultural parameter of Low Context versus High Context cultures. This discussion of cultural parameters comes from Chris Pullenayagam, a trainer with the Episcopal Church Mission Board. Low Context cultures, such as those in most of the USA, emphasize individual agendas, most or all the time: what each of us is doing at any time might overlap with what other people are doing. Our parties tend to allow dropping in and dropping out again, “come as you are” outfits including sneakers and sweat pants, “help-yourself” feeding (an endless snack table and a bucket of drinks). High context cultures emphasize “Occasions”: times dedicated by the whole community to preparation, formality of dress and ceremonial, long feasts. It is very important that you are there, dressed appropriately to honor the event, and that even if you don’t say a word at the event you stay the whole time. People need to see you sitting there and will ask you afterwards how you enjoyed it. I now appreciate the value of these occasions. Life here is stressful for Haitians, much moreso than for their American visitors. The list of everyday stressors is long and repetitive, and wears people down with discouragement. Things just don’t work, and it’s hard to get them fixed, and people who are sick can’t always go to the doctor, and jobs end without warning, and the money is losing value quickly, and food is expensive not to mention gas for the motorcycle. Celebrations give a respite: for the duration of that splendid ceremony, all who attend are human beings with dignity, presenting themselves as people of worth, and giving respect to others around them. It is a time to “ENJoy” , to admire each other’s very being, to stop time. It is a vacation from being stressed by the difficulties of getting through each day. It is an experience of joy in each other. It is community. It is grace. What’s going on in Haiti, and how does our life with FSRL fare these days? Hello! As always I have to apologize for long delay in posting. But happily I was invited by the parish of St. Thomas’s, Hamilton NY, (where we were when we started off on this adventure), to write to explain what’s going on. I hope they don’t mind if I use this same essay, with some personal messages removed? “It’s hard to know where even to start. I think I could compare what has been going on with what happens in central NY (and Montana too) when the weather is full of hazards, alternating with clear plowed roads and sunshine, sometimes unpredictably! Haiti is a wonderful place: a beautiful natural setting, and strong community bonds between people. Lots of spontaneous singing, especially hymns. Vibrant art and music. The students we are teaching are highly intelligent, motivated, idealistic, and besides that they make me laugh. Second-years learning to take blood pressure readings, in Basic Therapy Skills: Rejunior, me, and Peter Son. Fourth-years learning splinting, with Dr Gregory Chown of Alvernia University. Haitians in general live under a lot of stress. About 15 % of people have jobs with a salary, but everyone, 100%, works hard. Most are vendors of goods, new or used, and vendors of services, such as shining shoes, pulling a cart, driving a moto-taxi. The amount of money a person fending for himself or herself can get in a day might be 240 to 480 Haitian gourdes. When Donnel and I went to Haiti in Aug. 2015, that was $4 to $8 US dollars. But today that is only $3 to $6 US dollars. 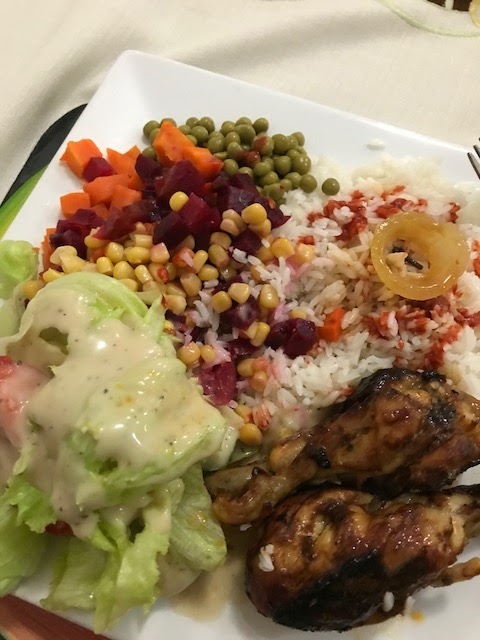 Food is not cheap, because most food is imported (perhaps from the Dominican Republic). If you have children to feed, that will not buy three meals a day. Many people eat twice, or only once, a day. Some don’t eat every day. People generally don’t go to the doctor, because it is too expensive, even if you can find a good doctor, so illnesses and injuries add to the tremendous stress. Power goes out frequently, and water is not always available either. Haitian people value taking a shower, often two, every day, and being without water for washing is very stressful. It costs money to buy bottles of water to drink. The rapid inflation has made people angry. In addition, the talk radio shows are on all day long. Recently the talk has been about apparent theft by politicians of over a billion dollars in long-term loans from Venezuela, from over ten years ago when Venezuela had oil money. The loan deal was called PetroCaribe, and applied to other Caribbean countries as well, but evidently the promised improvements in roads, hospitals, and schools never happened, and now the loan is being called in: Haitians have been told they need to pay for the repayment in taxes, esp. a tax on gas – which will put the marginal profits of moto-taxis at risk. About a month ago there were announcements of demonstrations on certain days, protesting the PetroCaribe embezzlement and demanding that the president resign. The announcements showed the level of organization by the opposition parties: they had a name, (“Country Lock-Down”) and a schedule of marches. Roadblocks were set up across all roads that pass into Port-au-Prince, which did shut the country down because all travel between north and south has to pass through the capital. People were warned, on all sides, not to attempt to pass the roadblocks. So the faculty and students did what they have done before, just what New Yorkers do in blizzards: shelter in place. Classes were interrupted because professors couldn’t come, the book keeper missed for two weeks so salary checks were delayed, our students who were out on clinicals had to miss two weeks due to clinic closures, and at the same time they were stuck in their distant areas, unable to travel back to campus for impromptu classes. Leogane is almost always calm and quiet. Someone explained to me that Leogannaise (local residents) like a peaceable life, and anyway they are surrounded by villages and towns that like to protest so they don’t have to add to it. But finally after a couple weeks, one afternoon while Lafleur (our administrator) and I were at the desk on our office, we saw the heavy smoke from a burning tire, and we heard shouting and gunfire – the gunfire of the police shooting in the air, trying to restore order and disperse the crowd, outside the (guarded) locked gate of the compound. It was unnerving, but it happened only once. The Dean of Nursing, Dean Alcindor, called me in and said she really wanted me to go home. I was planning to go anyway, but not for almost two weeks later, to be home for Donnel’s birthday (March 1!). But she asked me to change my reservation and clear out much sooner, if possible. I changed my ticket to the next weekend, and then we went on with classes as usual. The wait for the day of departure was an odd one: it seemed to me that if the roads were to open up to allow me to get to the airport, then that would mean that there was no need to leave the country! The Nursing school van driver did not want to drive into the city, with all that going on. Then Dean Alcindor realized that the local Episcopal hospital had been transporting patients back and forth every day with the ambulance, and she asked the hospital if I could ride along, which I did! And, right after I got home, the whole activity began to wind down. Now, people are just tired of being unable to come and go, and there is not much energy for the protests. I have been asked to wait for the decision of the Mission program of the US Episcopal Church, to allow me to go back. There’s an issue of the US State Dept. Travel Alerts: when all this started, they raised it to a Level 4, “Do not travel”. From what I hear from other expats still in Haiti, that is more relevant to Embassy staff in the capital city than to US or Canadian people working outside the city in small towns like Léogâne. But as long as that Alert is high, it is hard for official organizations to imagine that actually life is returning to normal. It seems that it really is though. Traffic is flowing, schools are open, vendors are open to sell food and water again. Donnel and I have been asked to wait until after Carnival, March 3,4,and 5, to see if the current calm holds, and then maybe I can return. WHAT IS THE EFFECT ON STUDENT MORALE? In the meanwhile, it’s not as if you can just turn off daily life at the university, just because the administrator has been pulled out. It’s not just me, an administrator, either: many US and Canadian professors have had to cancel their teaching for the coming semester due to the dire “Level 4”. 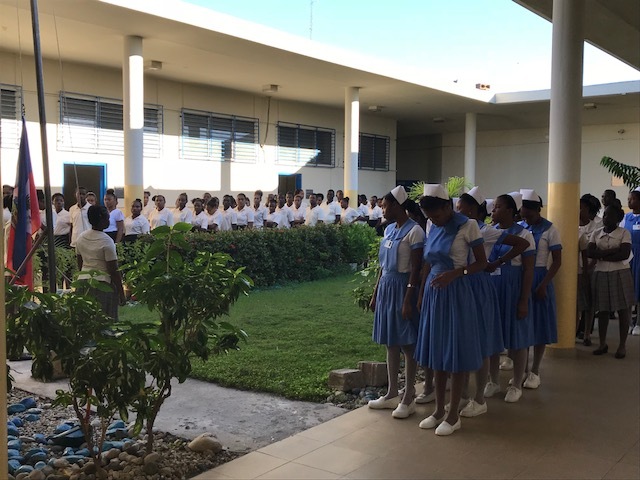 The students are anxious and unsettled, dreading that the program will have to close (as Haitian universities often do), hoping that they can finish their senior research projects and graduate, disappointed because several very good training opportunities in chronic wound care, and in making adaptive equipment, were cancelled due to roadblocks and due to necessary cancellations by US faculty members. They feel that they are seeing a risk to the possibility to complete their degree. WHAT IS BEING DONE TO PLAN TO MEET THE CHALLENGES? Donnel and I have been meeting with HRF, the Haiti Rehabilitation Foundation, and brainstorming about how to assure the students of safe passage through this time of challenges, and safe arrival at the degrees they are working so hard for. The plans are emerging, with some surprises and some advantages: “crisis” and “opportunity”, they say, are two sides of the same coin! More updates to come. A RENEWAL OF OUR THANKS! In the meanwhile, speaking especially to those who have supported FSRL with their financial treasure, whether vast or a widow’s mite, I want to say that HRF is very aware of using good stewardship of your gifts. We will come through OK, all of us together. LET US BE GRATEFUL, EVEN WITH THE “HEAVY LIFT’, AS IT LETS US SHARE THIS EXPERIENCE IN SOLIDARITY WITH THE GOOD CITIZENS OF HAITI! I am grateful for this experience, privileged to have been able to accompany these students this far, and so happy to see the beginning of their work with patients with all sorts of disabilities, who would not have had any hope of getting back to their lives. This is so worth the “heavy lift”! Second-years, Samantha and Karly, with a young patient with hemiplegia, accompanied by Dr Laurie of Live Beyond, Thomazeau, FIRST TIME OUT WITH PATIENTS! Guest Blog: Mme Stephanie Goodrich teaches Neuroanatomy! Second-year students in OT and PT, wearing their best scrubs, with Mme Stephanie Goodrich, center, and with M Emmanuel Occidor, interpreter, who is wearing a jacket: November 9, 2018. Hello! Bonjou, bonswa! My name is Stephanie Goodrich. I am here in Haiti to teach Neuroanatomy, a 4-week course for the second-year FSRL occupational and physical therapy students. At home in North Carolina, I work as an occupational therapist in acute and inpatient rehabilitation facilities. I first learned of FSRL when searching the internet for opportunities to travel overseas and serve with my occupational therapy education. And what a wonderful opportunity this is! Every day, I am amazed by the dedication, intelligence, and focus of the FSRL students. Despite that my lectures, given in English and translated to French, are not in the students’ primary language (Haitian Creole), they maintain focus and absorb very challenging material. They are not afraid to ask questions (many, many questions!) to make sure that they fully understand. Even as new second-years, they constantly strive to make practical connections between what they are learning and how it pertains to disability and rehabilitation. The neuroanatomy class meeting in the Common Room of the dorm. 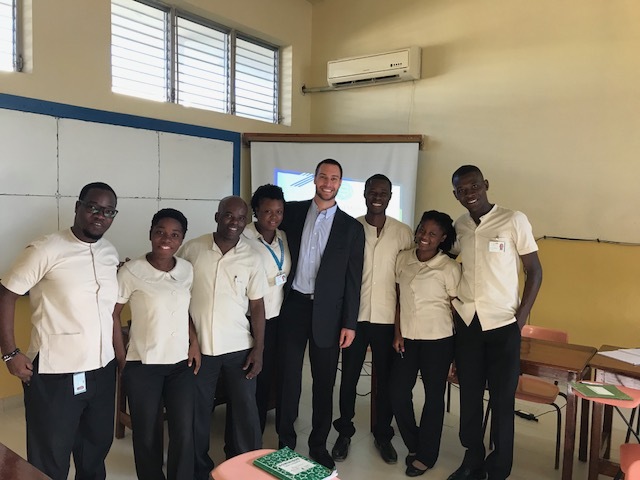 Over the past few weeks, when not teaching, I have also had the chance to observe some of the “behind-the-scenes” work of managing a new rehab university program in Haiti. Needless to say, there are many aspects of the program that need tending to on a daily basis, on top of all of the big-picture planning needed to keep the program going into the future. Dean Janet is a real-life Superwoman! It is plain to see how both how much the students respect her and why. I have also been blessed to spend some downtime with a few of the staff members, who have gone out of their way to help me feel at home and even teach me some Creole. As it is with any short-term trip, I wish I could stay longer and do more, but I am so very thankful for the time I have been given at FSRL to get to know the students, to spend time with Dean Janet, to meet a few of the program’s other important contributors (Kate Barrett, Julie Booth, several other volunteer professors and students), and to be a small part of something incredible. FSRL will be in my prayers and in my heart, until I return again (and again and again, I hope!) and always thereafter. I felt like a child on the first day of school. I woke up at 5:30 am ready to go. Sadly we did not start until 8 am so I did some personal reading and even reviewed some of my slides to make sure they were correct. After a traditional Haitian breakfast I made the walk over to the school to start the day. At 7:55 am all of the students were in the commons of the school lined up. I learned that like in America they respect the flag before school starts. The entire school sang the anthem as the flag slowly ascended to the top. The passion in each students eyes and voices as they sang was so strong. I got chills on my arms as the song concluded and each student rushed into their classroom. I would expect this in grade school, but to see 20-40 year old adults doing this shows how much this country means to them. I prepared 6 lectures for the day and knew it would be a long day for them. I started by getting to know the 7 students who are 4th year physiotherapy students. They have made it so far and I could tell from the first few minutes that they were all hard workers. After setting the objectives and going over the syllabus I started us with an icebreaker. I asked two very deep questions alongside the basics to help get to know them better. The first question was “what is your biggest fear” and the second was “if you won the lottery what are the first three things you would do”. I was very impressed with their answers and learned a lot more about their culture and emphasis on community. During the first half of the morning we focused on Clinical Reasoning and reviewing concepts from the foundational courses. They have retained a lot of the content which made the conversation much more interactive. After lunch we worked on expanding hypothesis generation to improve creating differential diagnosis lists. 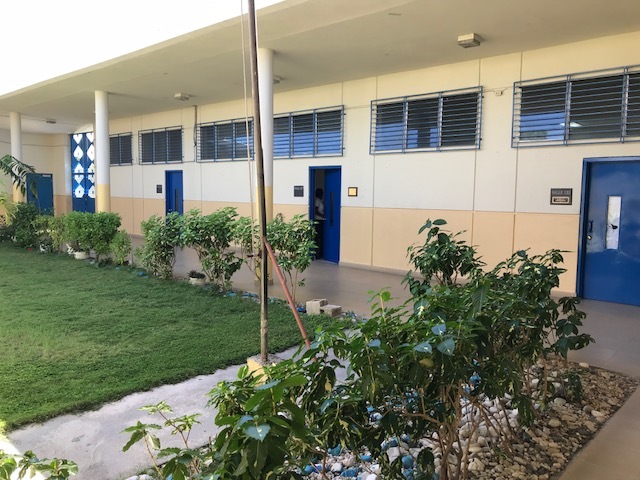 I learned that as an education system, the Haitian students have very strong memorization skills as this is the main learning style they are taught. They struggle with more abstract thinking and application of knowledge. These students in the physio program have been working hard on these concepts and I can tell they are beginning to learn this skill and will improve it as the year continues. I was very impressed with their conversation about clinical experiences. Many of the students expressed that the way of thinking they have been learning in this physiotherapy curriculum is very different than how clinicians in the country are practicing. They were excited to apply all of the knowledge they have learned prior to the rotation, but felt many of the therapists were not doing thorough assessments and still using very outdated treatment styles. It was so inspiring to see motivated therapists who want to improve the profession and challange the status quo of current practice. I hope that this week only adds wood to that fire. After class I shot the basketball around on the outdoor court near the campus. One of the students saw me and we played a little one-on-one. Not playing ball in over a year and being in 90 degree heat left me exhausted by the end. Chicken, rice, and fresh vegetables was a great end to the night. I spent the night working on some of the lectures and self reflecting. I have a long way to go with my skills as an educator but after doing it for 8 hours straight I can say I love it!